PAN India BSNL on occasion of upcoming Festivals Christmas 2015 and New Year 2016 announces Promotional Offers for Prepaid customers under GSM Mobile services. 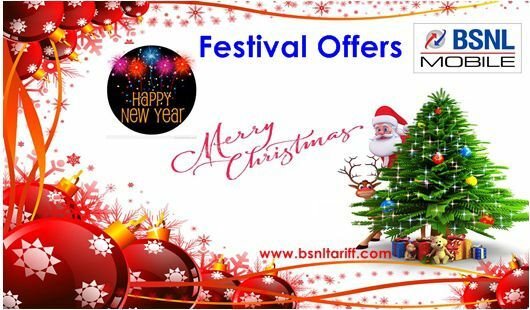 State owned Telecom Company Bharat Sanchar Nigam Limited (BSNL) has announced ‘Christmas 2015 and New Year 2016’ Special Offers for all Prepaid Mobile subscribers across the country under Prepaid plans mobile services for limited period. During this Festival season BSNL offers ‘Special Extra Talk Time Offer on selected GSM Topup Prepaid Vouchers of Rs.290, Rs.390, Rs.890, Rs.2000, Rs.3000 and Rs.5000. The existing 2G/3G customer or new customer of any BSNL Prepaid Mobile plan can avail this extra talk time benefit to make upcoming festival more joyful. The above Festival Offers will be implemented with effect from 21st December, 2015 onwards and available upto 2nd January, 2016 as promotional basis. I recharged my mobile no. 9414806775 on 21/12/15 but the amount of taxes was deducted and not credited by Rs.1000/- while I chhoose to get Rs.839. It is shame on the part of bsnl.